One aspect of pregnancy that women often overlook is that they will need different shoes while pregnant. It is unlikely that you will feel comfortable in heels for long so you will want to have a good selection of flat shoes to choose from for each occasion. It is common for pregnant women to suffer from swollen feet and ankles, especially in their third trimester so you will want shoes made from soft materials. By this stage, slip-on shoes will be your best friend as you won’t need to struggle to bend down to put them on. Everything takes a bit longer than usual when you are pregnant so you will be grateful for anything that will help save you time. Your feet will most likely grow a bit bigger when you are pregnant, and you will want shoes that make you feel the most comfortable and sturdy while giving you enough room to breathe. While there are no specific maternity shoes, there are lots of options that will provide the right kind of comfort and support you will need when you are on your feet. It is important to remember to look after your feet while you are pregnant, especially if they become sore. It is also important to remember you will need some great shoes that will support your body as it changes while your baby grows. If your lower back and knees start to feel strained under the weight, you will feel better wearing a sturdy pair of shock absorbing shoes with soft soles to ease some of the pressure. They will also make walking much easier. View the Best Shoes for Pregnancy, Below. How to Tie shoes when you are Pregnant? When in Pregnancy can Putting on Shoes Become Hard? You will want to be as comfortable as possible during your pregnancy, and the shoes you wear will play a big part in this. Whether you prefer a more athletic look or if you find slip-on shoes more comfortable, there are plenty of options on this list for you to choose from. 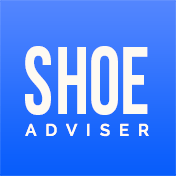 We have made it easy for you to decide what you need by explaining all the pros and cons of each shoe to help you make the best decision. With this buyer’s guide, it will be much easier to decide which kind of shoes are best suited to you during your pregnancy. 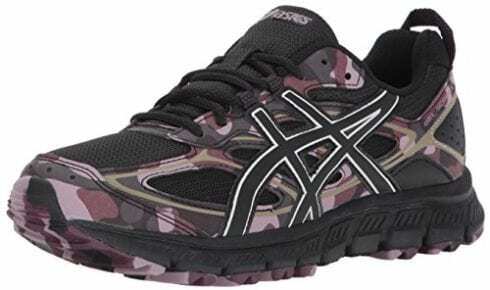 The ASICS Women’s Gel-Scram 3 Trail Runner is an activewear shoe that features an impact-specific gel cushioning system for increased comfort. This will be especially useful during pregnancy as they will give you some extra luxury and keep you as comfortable as possible. They are made from synthetic materials which means they will be light and easy to walk around in without having to spend time waiting for them to be worn in. The rubber sole will also provide extra grip and contribute to the comfort of the shoe. The rear foot gel technology will also bring you extra support and comfort while on your feet. They are designed for good ventilation to keep your feet cool and comfortable. These activewear runners are designed for comfort, and the GEL technology will reduce impact to provide you with extra cushioning. 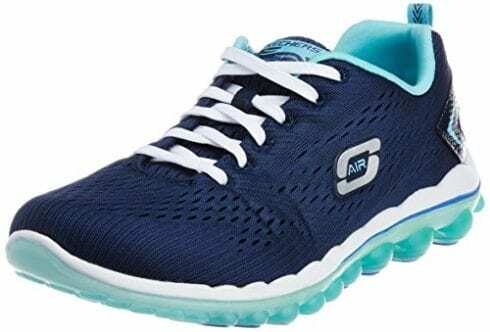 The ONEMIX Women’s Air Running Shoes are great for wearing during pregnancy to keep you comfortable as well as look stylish. They have strong grip and gravity stress relief soles which is ideal for when your feet need extra support. They have effective ventilation holes to ensure your feet don’t get too hot which will keep you feeling cool and calm. Their palm rubber air cushion soles provide extra support and cushioning with every step, helping you to feel lighter on your feet when you need it the most. The soles are also abrasion resistant and anti-slip giving you stability. Their soft and comfortable insides provide support without leaving your feet feeling restricted, and the sloping tongue enhances feelings of comfort and support. These shoes come in a great selection of colors, so you don’t need to compromise on style while still having comfortable feet. 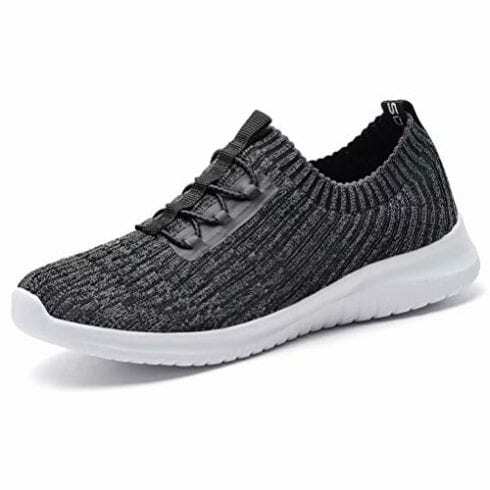 These comfortable walking shoes have an athletic feel to them, but with a mesh design and no laces, you will feel like you are wearing socks. The stretchy knitted material is soft and flexible which is ideal during pregnancy when your feet might change in size. The sole is non-slip with a soft feel to provide you with stability and comfort. The inner sole is also cushioned for even more support. The arch support will help relieve your feet from pressure with extra spring to the outer sole to make walking easier. The mesh front is designed to be breathable and will stop your feet from getting hot and irritated. These shoes are soft and comfortable, made with a flexible material which means your feet won’t feel restricted without worrying about laces. These sturdy and practical trainers are made with suede and mesh materials for a breathable and light texture as well as great style. The stabilizing heel overlay and side knit panel provide extra support when you need it most. The memory foam cushioned insole is gel infused for increased comfort and impact reduction which massages your foot all day. 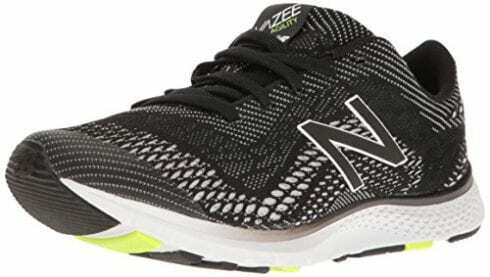 The midsole is lightweight, and the responsive cushioning offers increased impact absorption to help keep your feet comfortable even when they are sore. The sole is designed for grip, and the air pockets will keep your feet comfortable when walking. 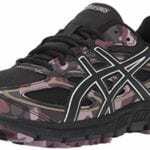 These sneakers are specifically designed for ultimate comfort and durability to provide you with the support you need. New Balance Women’s FuelCore Agility trainers are both feminine and practical at the same time. 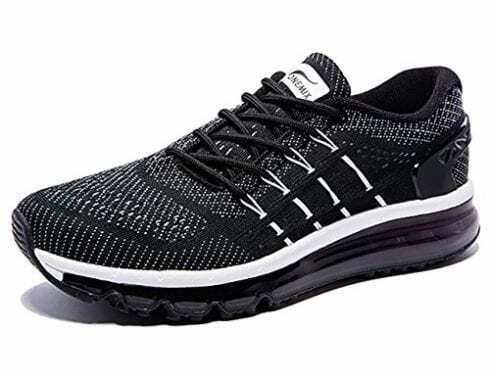 The upper material is made from engineered performance lace to provide durable foot support while also allowing them to breathe which will keep your feet comfortable and cool. They are flexible which will increase your comfort and mobility with an ultra-lightweight REVite midsole. This technology delivers comfortable cushioning to provide you with the best experience while on your feet during pregnancy. The wrapped tongue designed helps to keep the tongue in place for better support for your foot. They are designed for superior traction on any surface which will provide you with excellent grip and stability wherever you go. These athletic shoes will give you extra support and stability with their multi-surface superior traction which is ideal for mums-to-be who are on the go. These classic loafer shoes are simple and effective in providing comfort for your feet. Their elastic corners will allow for adjustments in size as you go through your pregnancy without the worry about laces. They are lightweight which means walking in them is easier, and the soft canvas is instantly comfortable with no wearing in period. The fabric lining is breathable to keep your feet cool and comfortable without sweating. They are designed to be worn all day without pain, and the classic shape looks timelessly stylish. The soles have a good wear-resistant, anti-slip grain to give you stability. They are easy to clean and include damping and abrasi on resistance to make walking feel more comfortable. This classic shoe is perfect for those who are looking for a less sporty option while still wanting the comfort of soft, breathable materials. These LANCROP Athletic Walking Shoes have an original look with a lace-up and slip-on design that is the best of both options. 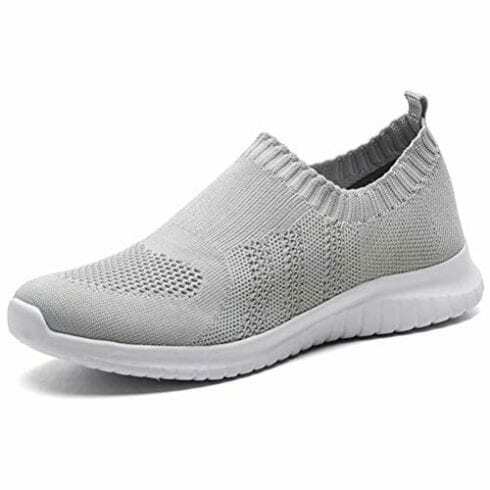 The benefits of comfort and convenience of a slip-on shoe are combined with the elastic laces that keep the shoe from slipping to give you the best support. They pull on and off for easy wear, and the slip-resistant outer sole will increase your stability. The soft, sock-like ankle will provide a non-restricting comfort to tired feet. The lightweight mesh material is comfortable and stretchy with a breathable upper material that will keep your feet cool. The flexible outer soles are soft and easy to bend to give you more cushioning as you walk. These shoes have a great design with the benefits of both laces and slip-on shoes. 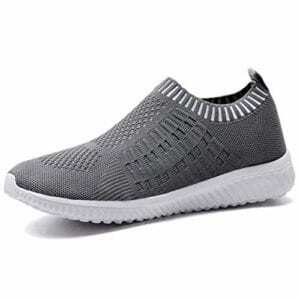 The LANCROP Athletic Slip-On Sneakers are extremely comfortable with a stretchy knitted mesh fabric that will support your feet without restricting them. The soles are bouncy and flexible for comfort when walking, and their soft cushioned lining is lightweight for a sock-like feel. The breathable textile material will help your feet will stay cool. 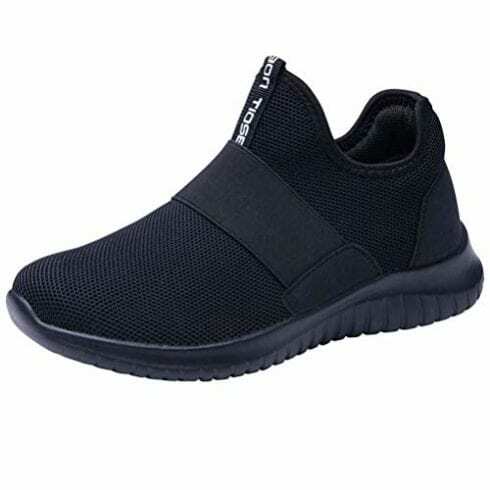 The slip-on and supported heel design mean they will be easy to take on and off, the outer sole is made from flexible rubber to provide grip and support while reducing impact. Their low, soft elastic ankle will give your feet room to breathe and will be comfortable if you suffer from any swelling. The inner-sole is curved to provide extra support for your foot, and the simple design is stylish as well as supporting your foot and preventing it from slipping. 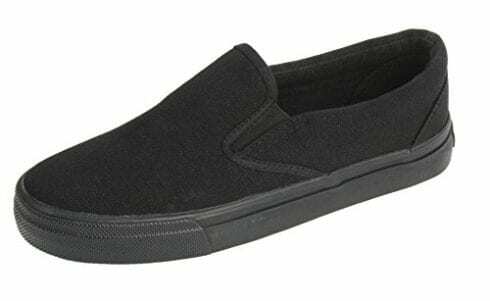 These stylish slip-on sneakers provide support with a soft sole as well as being soft and lightweight. These low-top canvas skateboarding shoes are made from soft material and can be easily bent for instant comfort without waiting for them to be worn in. Their outer soles are made with anti-slip technology to give you extra stability even in wet weather. They come in a wider width fit which will mean your feet will have the extra room they need to stay comfortable if they become swollen. The fabric lining is breathable to keep your feet cool, and the stretchy material will support your feet without restricting them. They are lightweight, and their shock-proof soles will increase comfort when walking. 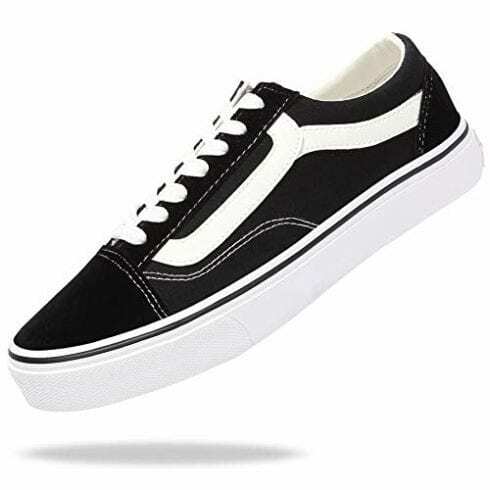 These Skateboarding shoes are an alternative to the more athletic styles on the list and are great for their wide-fit. The Lancrop Breathable mesh shoes are made from soft flyKnit fabric material for a relaxed and lightweight feel. There flexible and breathable to keep your feet cool and comfortable. Their rubber outer sole will provide grip and traction for stability while being soft for extra bounce when walking. They are easy to take on and off with a stretchy texture that will allow you enough room for your feet by keeping them secure without restricting. The elastic top line is soft and will gently support your feet. You will be able to stay on your feet for as long as you like without getting fatigued as these shoes will hug your feet and provide them with the extra support needed during pregnancy. These mesh shoes are casual and comfortable with a simple design that will provide support. You will hardly notice you are wearing shoes with their lightweight material. With all the different options it can be difficult to decide which kind of shoe is best for you. Here we have listed all the different things to consider before choosing your pair. As your pregnancy progresses, you will find it more difficult to bend down to put your shoes on. This is why it is important to choose a pair that you know you will be able to wear easily. While laces can be useful if you need to keep on adjusting the size, slip-on can be much easier to put on and take off. Most of the slip-on shoes on this list are made from a soft and stretchy material which means your feet will stay comfortable even if you suffer from swelling. Paying attention to the amount of support the shoe offers is important. It is common for women to suffer from sore feet and ankles when they are pregnant, especially in the third trimester. You will want to allow for room in your shoes to get bigger in case you suffer from swelling as you don’t want your feet to feel tight and uncomfortable in their shoes. Cushioning in the sole will help you feel better while added arch support would be even better. Most of the shoes on this list have anti-slip soles so you can confidently walk with stability. You may want to choose a larger size than you normally would. If your feet or ankles become sore or swollen, having tight shoes will be incredibly painful. Some shoes also come in a wider fit which is worth noting as they may be more comfortable if your feet begin to swell. The kind of sole the shoe has will significantly change how comfortable your feet will be. It is better to choose a shoe with a soft, bouncy sole and the thicker, the better. You might feel tired on your feet, and the soles will soften each step for you making it much easier to walk around. While you are pregnant, you will want to be as comfortable as possible. Choosing shoes that are made from good quality material will help your feet to stay cool while providing good support to give you balance and grip. If your feet can’t breathe and your feet become hot and sweaty, it could worsen the swelling and make you feel irritated and uncomfortable. You will also want soft and flexible materials that can gently expand without being too loose so they can bend with your foot easily without restricting them. Shoes made from natural materials will be more likely to allow your feet to breathe. However, synthetic material is often softer and lighter. While it is possible, it can be uncomfortable and frustrating to tie shoelaces when pregnant. How difficult you will find bending down will depend on the size of your baby. It is important to be extra careful when bending down as you can become unbalanced which may result in a fall. The lower back may also be in some pain during your third trimester. You may find it easier to hoist your foot onto something higher that is stable enough for you to lean on. Sitting down on a chair or bed is also helpful as you can then cross your foot over your knee to tie your laces, but pregnant women often find this problematic towards the end of their pregnancy. Putting shoes on can become hard when your baby has grown big enough to make it difficult to bend down. This usually occurs in the third trimester, but it depends on how big your baby is and how quickly it grows. Choose the right shoes for your pregnancy not only for the comfort of your feet but for safety and stability. Your preference in footwear is likely to change during your pregnancy. The further along you are, the more likely you will want to wear a slip-on shoe as it will get harder to tie your laces. We hope you enjoyed our article on "10 Best Shoes for Pregnancy in 2019", if so, please share and rate it.